This is day one of the quilt commission. I have sketched the composition onto the canvas and begun a turpentine (orderless thinner) and color wash. I hate starting on a white canvas a feel some accomplishment when the white is gone. 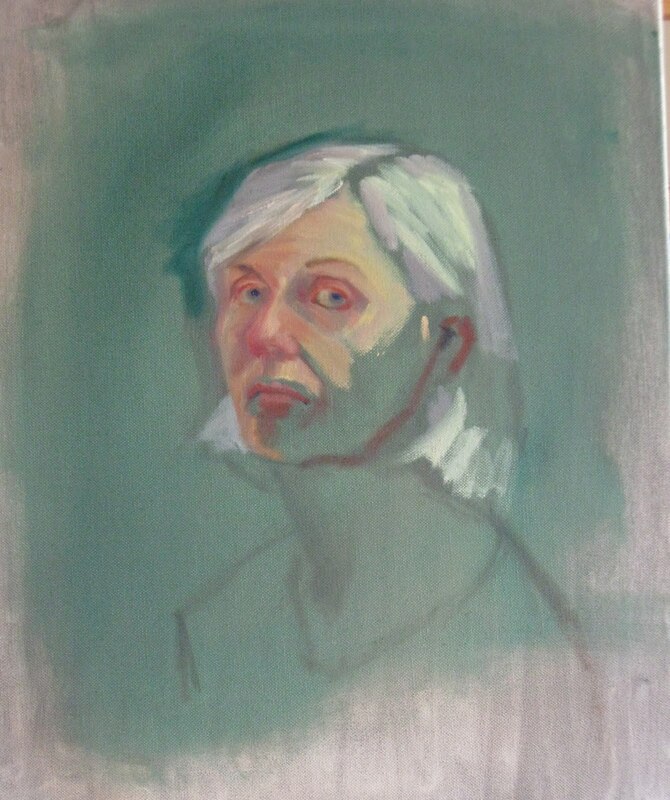 I usually tone my canvases when doing a portrait or figural piece. Why I don't tone all my canvases is a mystery to me. Guess I am just in a hurry. I have been commissioned to do a painting of a very special quilt. I visited with the client to get a sense of their desires and ideas and took thousands of photos. After reviewing the photos, I did three sketches in color of three ideas I had for the composition and mailed them to the client. I have received back the client's choice of composition and size desired. Yesterday I began the painting by sketching it onto the canvas with charcoal. I began to wash in the background using a very thin mixture of color and turp. I will continue on the painting today and take some photos for the next blog. Also, got an hour in the yard this morning. 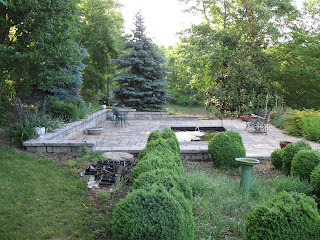 Planting some dwarf Alberta Spruces in pots around the fishpond. Swept a bazillion ants into the pond and the fish went crazy.......I am their favorite human. 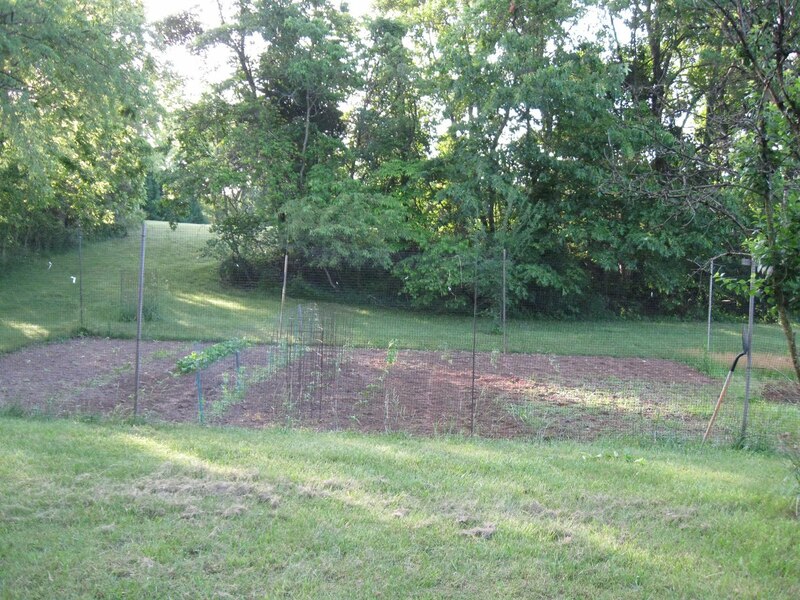 I can't believe that it has been three years since I had a veggie garden. My last garden was the summer I found out I had Lupus. At that point, I would work at anything for an hour and then need a two hour nap, my hair was falling out and I simply could not function like a normal 50 ish person. It was the last time that I did any canning and I had canned 40 quarts of tomatoes that year. Also I was exhausted all the time. Well, those tomatoes ran out this winter and I am putting in 18 or so tomatoe plants so I can stock up on my home canned tomatoes. I know this looks like a small plot, but I have 18 tomatoes, 16 various squash plants, 10 peppers, rouquet, swiss chard, beets, peas, basil, fennel and a few mystery plants......we did not label the row and I can't remember. I put in collards this morning. This is just half my normal garden. The other half out of the picture is filled with cut brush to be burned, but we did not get it burned before putting up the deer fence. Another fall task I suppose. I feel really good today! I have worked in the garden an hour for the last three mornings and it has made such a difference in my mental and physical health. I know today will be a great day at the studio. buzzmyart.com. Stay away from the site which was supposed to be an online gallery. It is actually some sort of virus and somehow all of us are being bombarded with each others angry requests to unsubscribe. I am such a technological dinosaur and can't imagine how this works or how I can stop it. I just deleted 84 angry emails directed at buzzmyart, but somehow sent to me. If anyone has advice, please send asap. Also, my session with Alice this past weekend was a bust, I froze up again. Then the next day, my model was sick and could not make it. I am calling it quits for the challenge for now, since there is just one week to go and I am not going to make it to the goal of 10 portrait studies. On the positive side, my drawing "Study for Venus" was juried into the Art League Gallery show this month. It is a trois crayon drawing which I posted not long ago. Recently, Brett and I visited the Museum of the Shenandoah Valley thinking that this would be a tiny museum full of farm implements and early settlers exhibits with maybe one or two references to Patsy Cline, since she was a Winchester native. Imagine my astonishment and pleasure when after viewing the aforementioned items, we walked into a room marked "Gallery" above the door. Inside the supposed gallery was a room of landscape art and then another room titled the Grand Tour and finally a phenominal collection of portraiture that the last heir to Glen Burnie, Julian Wood Glass, Jr, had amassed while living in New York. There were paintings by Cropsey, Gainsborough, Joshua Reynolds,Thomas Lawrence, John Singleton Copley and my personal favorite Gilbert Stuart. The artworks span three centuries and also there is the sofa once owned by England's Queen Charlotte which is also seen in a wonderful portrait in the display. You just don't expect this complete and fine a collection in Winchester. Not only does this museum hold two of my passions, history and art, they also have a fantastic display of miniatures in an adjacent room. This is the collection of R. Lee Taylor and is not just your usual tiny doll house, but holds a mansion Mr. Taylor designed and built himself, complete with tiny paintings in almost every room. There is also a general store, a river plantation house (complete with ghost) and absolutely amazing furniture and furnishings all built by Mr. Lee or some of the most noteworthy miniaturists of our time. There is also a chair collection and display (not my thing). Be sure to allow time to also tour the Glen Burnie Historic House and the fabulous gardens. The gardens are a must for anyone who aspires to be a Master Gardener or Landscaper. There is a charge for each area, or a 3 for one price special. Seems like this portrait challenge was an unrealistic undertaking. I can't get enough models. Everyone is too shy. But, Alice is coming back on Friday and I think her portrait may just turn out decent if I can get past the pressure I am placing myself under. Also, Jennifer came down to the studio on Saturday and we had a real good first session. She originally volunteered to be Medusa, but during the photo session I determined that she is more the Virgin Mary type or even a good Venus. Since my Venus quit me, Jennifer has agreed to step in and model for that one. Jennifer has a really adorable dog named Bronson. I think I will ask Bronson to model also. This week, I traveled to the National Gallery of Art in Washington DC to clean out my copyist locker and pick up my painting. Because of the ever worsening gas situation, DC's parking meter hikes and the lack of parking, not to mention the incredible 2 hour drive in rush hour traffic, I simply was not enjoying copying at the NGA very much anymore, because of the stress of getting into DC. I also have Lupus, which is directly affected by stress. 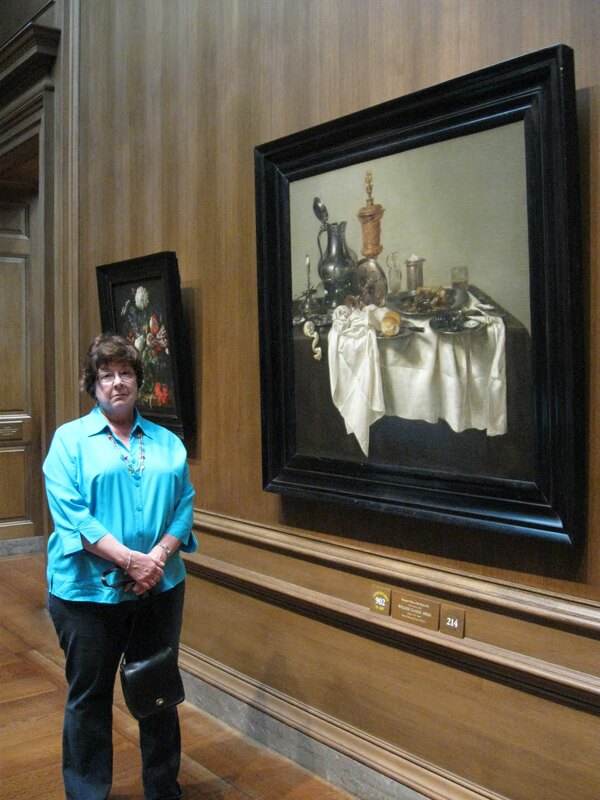 This photo is of me standing beside the last painting I was working on copying. I have it about 2/3rds finished and it was quite a huge undertaking. The painting is by Willem Claesz Heda and is called Banquet Piece with Mince Pie. I intend to finish it from photos, although this is not the best method, since I won't be able to really see the true colors or brushwork. This incredible journey of self instruction at the National Gallery started in 2001 and has been invaluable to my education. Don't I look sad? I am! Looks like I got some more much needed press this week. I have two images in the Rappahannock News this week on page B1 in the Countryside section. 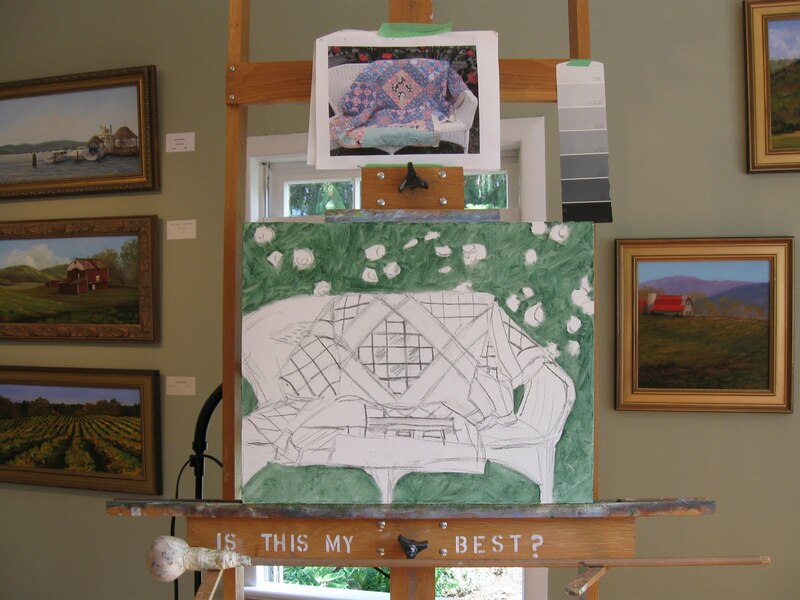 For a small newspaper, they do a very nice job covering the art scene in Rappahannock County. I call this painting my Italian Fruit Basket. It is almost finished. I started it on Sunday when I did not have a model. I have probably worked on it for a total of 9 hours. This is one of those paintings that seems to paint itself. I have two light sources on it which gives me a warm bright highlight on the left and a cool north light coming in on the right. Also, the lights are coming from above. 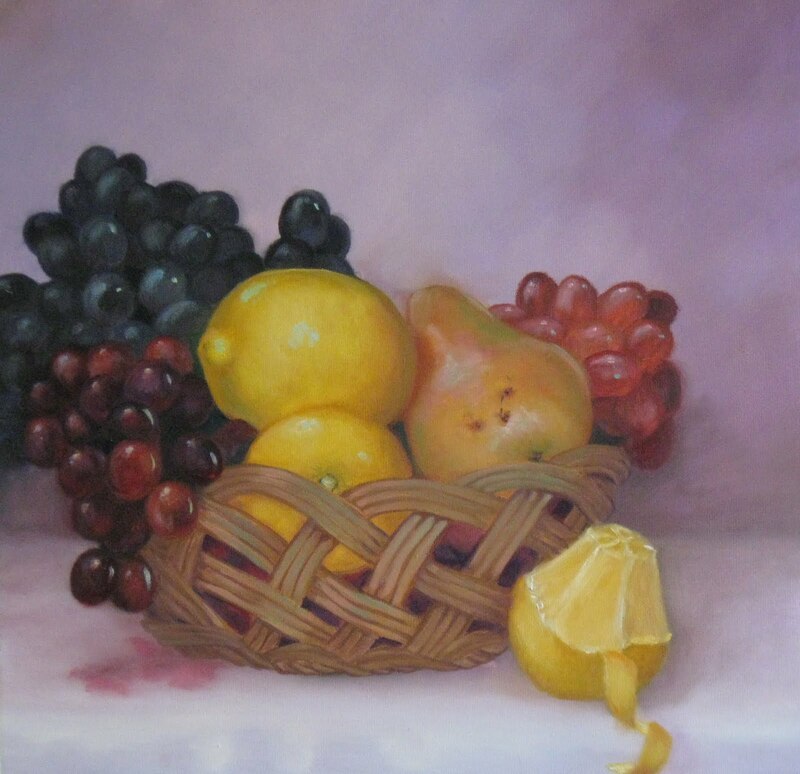 I actually have this basket of fruit on the easel bar right beside the panel and the panel is 12 x 12. The fruits are painted their actual size. I will most likely spend another four hours on this painting. I am thinking of not adding any vanitas symbolism to this painting. Well, maybe just one little honey bee. What do you think? Alice sat for me again Monday. I tried twice to get going with the color. You can see that some of the original sketch is visible. Finally after painting and then wiping off all I had painted, I took Alice to lunch thinking that fresh eyes would see where I was going wrong. When we returned from lunch, I wiped off the whole mess again. I then realized that I was trying to paint like Michael Shane Neal and that just was not how my mind works. He is very fast and loose, laying in the planes of the face and sculpting the head rapidly and all the while carrying on a conversation with the model. So I told Alice that we would try it my way. I don't talk alot while I work and I am slow and deliberate with my color mixing and strokes. This is the result of one hour at my own pace and my own style. Yesterday's model could not make it and so I spent the day working on a still life. The still life is coming along almost too well. It is becoming my favorite still life, ever. I will photograph it today and you can be the judge. I have another model lined up for today. Cross your fingers, Linda! This challenge is not going the way I had imagined it. No model yesterday. But I lined up someone for a couple hours today. Hopefully I will not choke up again. Spent yesterday on a brand new still life. I actually placed a basket with grapes, lemons and pear on my easel bar that supports the canvas, right beside the canvas. It was amazing to have it there which influenced the size of everything in the picture. So the fruits are life size and it progressed so beautifully, it was almost completed before I left for home yesterday. I will finish up the basket today, after I am done with the model. Check out the back page of the Rappahannock News for April 29th, the Countryside section. 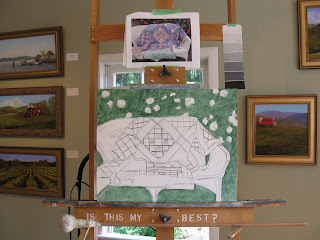 You will see a picture of me at my easel working on the Saint Alice painting. Well, not off to a good start. Alice came down to the gallery/studio and I made 5 attempts to get it going. I CHOKED UP! Wiped the sketch off 4 times. The 5th was not so horrible and I left it on the canvas. She will be back for another attempt. Maybe I am just psyc-ing myself out here. I got a great start on the Saint Alice in only half an hour.....so what's the problem now?